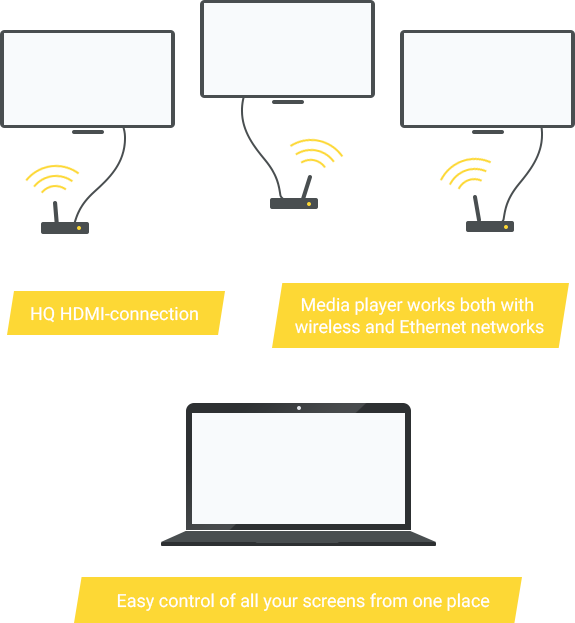 Want to change your screen into a digital signage channel? You can use the Promobox device with any digital screen with HDMI input. Attach the Promobox device to the screen and to the network. From now on you can add images, videos, music and webpages to your screen via Internet from anywhere. All you have to do is to log in to your Promobox user account and upload your files. "I saw Promobox devices in Casino. I want more!" "It works even better than Samsung system, which is well done too." "This is the most comfortable system I've ever used." Want to change your screen into a digital signage channel? Do not have quality screens yet?Contact us and ask for more. 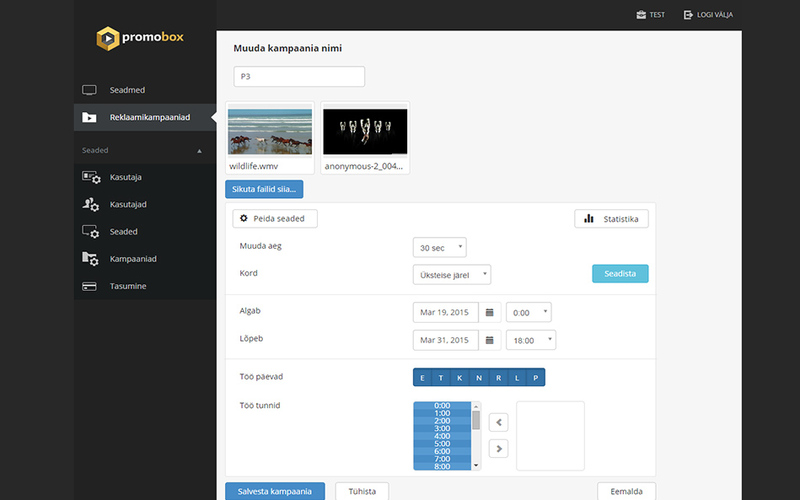 The cloud-based Promobox enables you to manage the content of hundreds of screens remotely from one location. You can add any type of file and Promobox will prepare convert it automatically. You can set up the duration of material demonstration and manage the time of start and finish. With Promobox all material on displays (or display groups) can be updated, edited and scheduled remotely from anywhere where there’s an Internet connection. Promobox is using SSL secured network connection and keeps on showing the uploaded material also offline. Promobox updates software automatically and in case of error Promobox will notifies you about that. 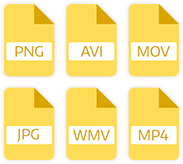 Images (JPEG, PNG, PDF), full HD video (all video formats), RSS feeds (news, weather casts, etc. ), web pages, text presentations and plays music. You don’t have to install an additional software; Promobox is working and managing via Internet browser. The Promobox device with installation and user guides will be shipped to you within 7 days. Total delivery time 9 to 21 days depending on destination. I’m not big on technology. Am I able to start using Promobox without help? Yes, you sure can use the Promobox without any special IT skills. You just plug in the power, attach the Promobox to the screen with a HDMI cable (we’ll send you one for each player), and attach the Ethernet network cable. The network cable is the same kind you use with your computer. How long am I engaged to use the Promobox service? After a one month free trial you can stop using the Promobox anytime you want. Just send us an e-mail or make a call. The last monthly service fee is charged for the ongoing month when you send us the e-mail to stop the service. The device is attached to the network. Is it safe to use Promobox? All data is SSL encrypted, which is the same security that banks use for their Internet services. No need to worry for breaches, we’ve made sure that its secure to use the Promobox system. Will the screen go black if the Internet connection is down? The Promobox downloads the material to its own internal memory and plays it from there. The network is needed only when uploading new material or editing the existing playlist. If the network goes down the Promobox will play the material it has already downloaded to its memory. After the network connection is back up the Promobox will automatically check if there’s new material or changes made to the Promobox system. Can I use a 3G or 4G connection to connect my screens to Internet? Yes, you can but you should consider couple things. First of all, you can’t connect the USB modem directly to the Promobox. You need a 3G router that you plug in to the Promobox with a cable. Also the data plans can be expensive. HD video and image material used these days can be quite large. Even though there’s data traffic only when uploading the files or making changes to the playlist, you should keep this in mind when making your mobile data plan. Contact us to get more info or individual offer. To use Promobox cloud service you need Promobox device. Are not sure? Get a one month trial period! Promobox OÜ was founded in 2014. Today the team consists of 5 people located in Tallinn, Estonia. Our digital signage products and services are used for different information, marketing and guidance needs in multiple different industries. Advertisements, offers, bulletins, price lists and lunch lists. The reliable and easy to use Promobox system is enjoyed by continuously growing group of satisfied customers like restaurants Enzo, Violet, Daily Special, casino GrandPrix, DPD delivery & electric SLO services and others.